For instructors / trainers / professors administering the test to one or more groups of participants. Email the participants to tell them to register themselves (just like you did in Step 1), and to let them know the Group Name and Group Password (the Group ID). Log back in later to check or manage your group and see which participants have completed the test, analyze their scores, etc. Some extra tips are at the end. You only need to register once (Instructors: your participants will each register separately later – you do not need to register for them). When you first register, you’re automatically logged in. On subsequent visits to AcrossCultures.com, you can always log back in by using the top menu: “Peterson Cultural Style Indicator“, then “Log in“. If your instructor emailed you a Group Name and Group Password (a Group ID), there’s no need to buy the test – you can now use this Group ID to complete the test. Once you’re logged in, you will see a link to “Buy” in the top menu. 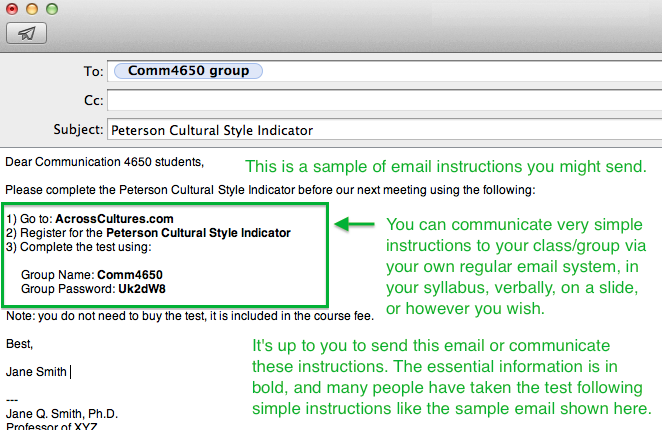 Individuals: Just buy one test for yourself using PayPal, then you will see a “Peterson Cultural Style Indicator” button to begin the test. Instructors: Use the “Buy” link to buy however many tests you want. When you buy tests, they are immediately added to your account. If you have 12 people in your group, you would buy 12 tests. All sales are done through PayPal. (You do not need a PayPal account to pay. PayPal accepts credit cards.) You might use a department credit card, then include the test ($14 per person) in the price of the training or ask students to reimburse it as a course fee. 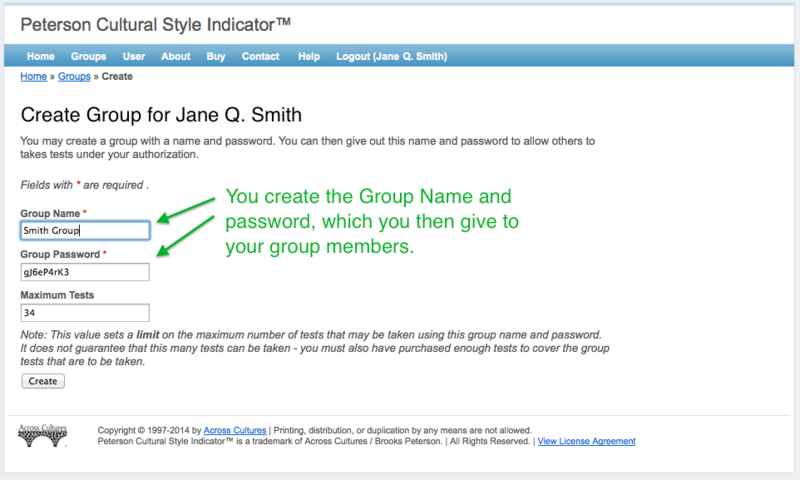 3) Create a group: The next step is to create a “Group ID” (a Group Name and Group Password) for your participants so they can take the test. This way, your participants won’t need to pay separately, they’ll just enter the Group ID (Group Name, Group Password) you give them and you as the group manager will be able to see their scores. At any time, you can log back in to see which participants have completed the group test, check their scores, and so on. You can buy more tests if people have been added to your class / group or if you plan on using the test with a new class / group. If you buy additional tests for a group, be sure to update the “Group Maximum” to make these tests available to whichever group you wish (your existing group, or a new group). The new tests you purchase are not automatically added to an existing group because some people manage multiple groups, and some might be buying the tests for a new group. Therefore (professors / instructors / managers) have total control over editing the “Group Maximum” for each group. This also means that, if you wish, you can stop people from taking new tests in a particular group by capping it with the appropriate maximum. For example, you have a particular group with a maximum of 15 tests enabled. It turns out only 13 people took the test in that group, and you are done with that group. To be sure no more take it, you would set the Group Maximum to 13. You can change this again, raising and lowering the maximum as needed. 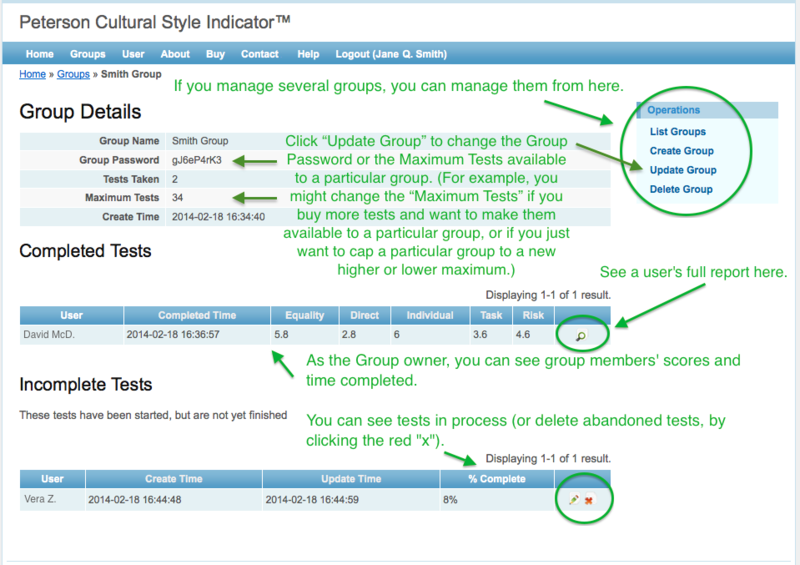 And you can always apply the unused tests to a future group you create while logged into the same account. You can copy and paste a group’s data into a spreadsheet or other software to analyze or summarize it as you see fit (see below). Unused tests cannot be transferred to different accounts. It’s not possible to “link” multiple accounts together or “transfer” unused tests among accounts, so be sure to buy tests while logged in as the person who will ultimately use those tests to create and manage groups, view participant scores, etc. For future reference, check the AcrossCultures.com menus: Choose “Peterson Cultural Style Indicator“, to find answers to Frequently Asked Questions, and so on. 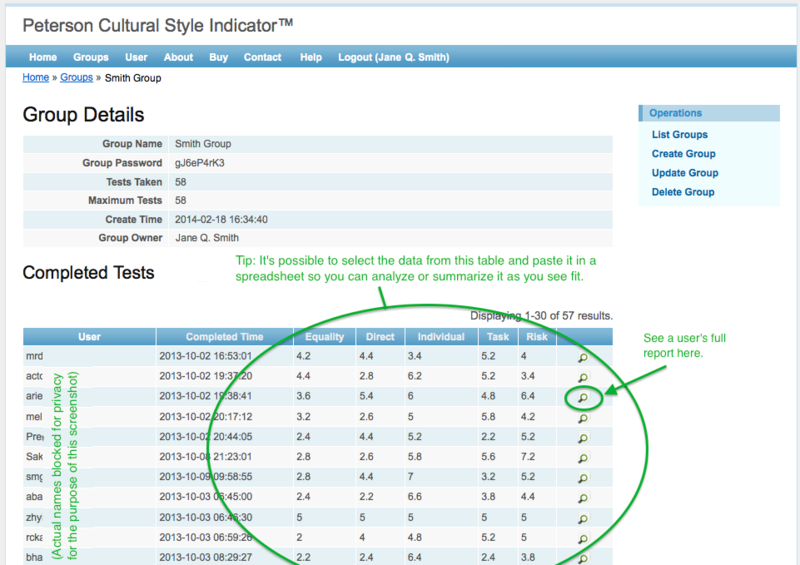 Note: The Peterson Cultural Style Indicator area has a blue menu bar across the top (as in the screenshots above). To return to the main AcrossCultures.com site, click the bridge logo at the bottom or top of any page. The book Cultural Intelligence: A Guide to Working with People from Other Cultures contains case studies, questions and other more in-depth discussion material related to the same culture themes covered by the Peterson Cultural Style Indicator.